Paying for open access: how much will it cost? FAQ: How do I find out whether a journal has an option for immediate open access and if so, how much it will cost? Does your proposed funder require immediate open access to all research outputs? Do you need to include the cost of APCs in your bid? Do you need to make sure your work has the earliest possible visibility and impact? If the answer to any of these questions is yes then you will need to know whether any journal you choose to publish in offers an immediate (‘gold’) open access option and if so, how much it will cost. FAQ: Does the University have any funds available to pay publishers’ article processing charges (APCs) and if so, how can I apply for these? As of August 1st 2016 the University of Northampton has set aside an Open Access (OA) fund to support the payment of article processing charges (APCs). APCs are the charges levied by publishers to cover the cost of making an individual article OA at the point of publication (aka ‘gold’ OA). This may be in a fully OA journal or in a ‘hybrid’ journal which makes otherwise subscription only articles available OA on payment of an APC. FAQ: Why can’t I access resources off campus? With very few exceptions (listed here), you should be able to use your university login details to access the library’s resources, irrespective of whether you are located on or off campus. If you find that you are not being given the opportunity to log in with your university details then there are several possible explanations. The PGR Thesis and Examination Policy states that it is mandatory for final, post-examination copies of research degree theses to be deposited in NECTAR. But what does this mean for PGR students (and their supervisors)? This post will outline the policy and procedure for depositing your thesis in NECTAR and some the issues you need to consider when doing this. FAQ: I have just had an article accepted for publication and I’m unsure of my open access options. What should I do? With multiple publishing options and a host of sometimes conflicting institutional, funder and publisher requirements, the pathway to open access can sometimes be a confusing one. The guide below is designed to help you navigate the route between having your article accepted for publication and making it open access in an appropriate and timely manner. The guide covers both ‘green’ and ‘gold’ routes to open access and includes the University’s procedure for handling article processing charges (APCs). FAQ: I am a new research student and the next induction week is some time away. What do I need to know now? First of all – welcome to the University of Northampton! There are plenty of people here to help you get started with your research – your supervisor of course, but also a number of people in the Graduate School and the Library. If you have any questions, please don’t be afraid to ask for help. Your top priority will be to make sure that you can access the university computer network and the various services that it offers. The checklist for new research students elsewhere on the Research Support Hub (this blog) describes what you need to do to achieve this. 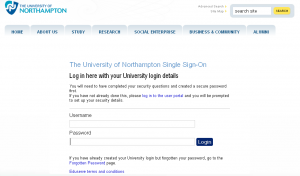 Now that you have all the right login details you should be able to find all the key information you need about being a research student at Northampton. FAQ: How can I be sure that my research does not contravene Data protection law? JISC Legal have just published a useful set of questions and answers on Data Protection and research data. Beginning with “What is ‘personal data’?”, the 24 questions cover topics such as “What are the basic rules for processing ‘personal data’?”, “What is a Subject Access Request?” and “Can I store my data in the Cloud?”. If you are working with any type of personal data then these Q&As could be worth a look. FAQ: I’ve just started as a research student at the University of Northampton. How do I get access to university IT systems and library resources? As a new research student it is important that you are quickly able to take advantage of the many resources and services available to you at the university. This checklist will show you how to log in to the different services and tell you where to get help should you have any problems. FAQ: A publisher I haven’t heard of has invited me to submit a paper to their journal. How do I know that they are reputable? Following the publication of the Finch Report and the subsequent actions of the Research Councils, HEFCE and others, there is more pressure than ever for researchers to ensure that their published outputs are made available to all. This has prompted publishers, both established and new, to reconsider their business models and provide new open access publishing options to researchers. I have written before about how to find an open access journal for your article, but what happens if the publisher approaches you? Based on the queries I’ve received from researchers, there seem to be two areas of concern.